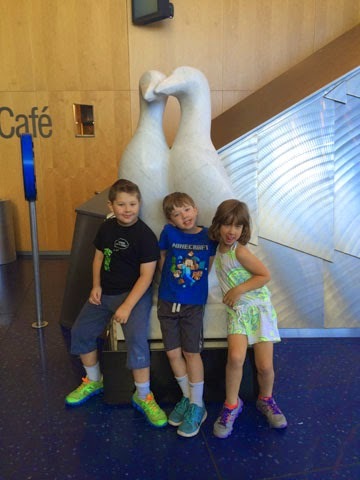 The Urban Unschooler: Unschooling Conference Recharge!! We are just back from the Unschoolers Waterpark Gathering at Kalahari Water Park in Sandusky, OH having had a wonderful week connecting with, watching and interacting with other unschooling families. I love doing the conference circuit, I always meet interesting people (adults and kids) and I get a chance to recharge while sitting in a room of many other parents with whom I don't have to explain what our lives look like at home. It's cathartic. Both Edwin and I got to do yoga every day and attend many of the discussions together. We made a bunch of new connections with other parents who have followed this path. I was able to re-connect with some folks whom I'd met in the past and I was able to forge some new relationships. My daughter made a friend within minutes of entering our hotel room and as is common for an unschooling conference, we hardly saw her for more than 10 minute intervals for the rest of the week. Two of my children, however, didn't attend any of the many conference activities or funshops. One of my sons enjoyed the waterpark and hung out gaming with a long-time Skype friend whom he had never met, in person, before this week. And my other son avoided the water park and kept the home-fires burning but rarely ventured out of the room. Although I expected my boys to pick and choose the activities in which they'd participate, I am still sometimes surprised by the realization that big social "to do's" (even those with kids who come up in a similar family life) are not where they gravitate at this time. But that's ok. I choose to do mini vacations at the various unschooling conventions/events for just this reason. The venues are very kid friendly and the participants are all very respectful of honoring kids where they are an not forcing them to "engage" for engagement sake. Like me, other unschooling parents don't get all upset or fearful when a child opts to stand apart instead of join in. And I knew we were not the only family who had kids who chose to lay low. I love that I am part of a community that understands that each kid interacts with the world in their own way and I love that my son who stayed close to home wasn't made to feel shame or lack in his choice. What I do walk away with, every time I come home from an event like this, is a firm reminder that we are doing exactly what is right for our family. I am bolstered in the fact that my husband is fully on board with our decision to follow this journey and we get to walk the path together as our kids find their authentic voices. Nothing could be better, we are so very lucky.